We start this episode with Alex having re-kidnapped Holden and brought him to her (his old) home. 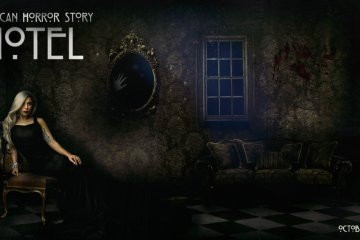 After he kills the dog to drink it’s blood, she decides to take him, not to the hospital (she is a Dr…), but instead back to the hotel Cortez where she meets the Countess. The countess offers to turn her into a vampire, and eventually she does. This seems at odds with Alex’s character so far. But then again, I am not a parent so maybe I just don’t get it. Meanwhile, the Hotel Cortez starts receiving some unusual guests for “Devil’s Night” (their version of Halloween). Richard Ramirez (The Night Stalker) shows up and kills a couple tourists with the help of James March. Detective John runs into Aileen Wuornos after he falls off the wagon. 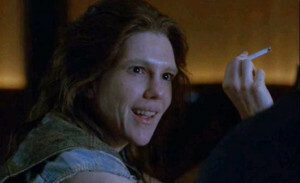 Lily Rabe plays Aileen Wuornos in an amazing performance. (I didn’t even know it was her until I looked it up to write this post). On a side note, I grew up in the area that Aileen Wuornos was stalking around the time she was killing. I worked nights at the time, and would often see those women selling their wares on the streets during my drive home. Her story has always fascinated me because I feel like if my morals had been a bit shakier at the time, I may have ended up one of her victims. Instead, I resisted the temptation to take comfort with her kind. I may be alive today because of that. There is some really get backstory in this episode for the maid (Hazel Evers played by Mare Winningham). Her story of loosing her son echo’s Detective John’s enough that one has to wonder if it is in fact true. So James March seems to enjoy inviting dead serial killers to the Cortez for “Devils Night” and he invites Detective John to join the dinner. This also seems out of place, and makes one wonder if one of the seasons twists will be that John is himself the “10 Commandments Killer” that he is searching for. After John has had a bit to much at the party, Sally shows up to convince him he is hallucinating everything, and takes him back to his room. This is one of Sally’s 2 scenes in the episode. Completely missing from Devils Night are Iris (who we saw being turned into a vampire in the last episode (wasn’t she already? ), and Romona Royale (who, after last weeks amazing introduction, is very missed in this weeks episode). Overall, this episode didn’t progress the overall story much (except in Alex’s case), but giving so much screen time to Lily Rabe, and Even Peters really made it one of the best episodes of the season so far. I just hope they find a way to keep Lily Rabe on this season for more then just this one episode.